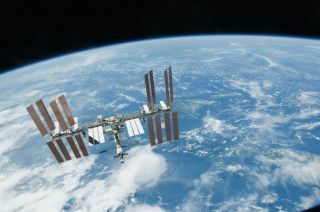 The International Space Station orbits 248 miles (400 kilometers) above Earth, and can be seen from the ground using a new interactive map called Spot the Station. The International Space Station completes multiple orbits around Earth every day, and now you can track the space lab as it passes overhead. At an average altitude of 248 miles (400 kilometers) above Earth, the space station is the third brightest object in the sky. Although this high-flying satellite can be seen from the ground, it passes by quickly, so it helps to know where to look. "The International Space Station's trajectory passes over more than 90 percent of Earth's population. The service notifies users of passes that are high enough in the sky to be easily visible over trees, buildings and other objects on the horizon," NASA officials said in the statement. "NASA's Johnson Space Center in Houston calculates the sighting information several times a week for more than 6,700 locations worldwide." In addition to the new interactive Spot the Station map, NASA has an embeddable Spot the Station widget (which you can see here) that allows users to find out when the station will pass overhead their location. The widget was released earlier this year, NASA officials said. The first component of the space station was flown into space in 1998. Since then, the orbiting lab has been pieced together to create the complex structure that is now approximately the size of a U.S. football field. The launch of Spot the Station falls on the 16-year anniversary of humans living and working continuously aboard the station. The Spot the Station tool also allows users to sign up to receive an email or text message notifying them the station will soon be visible in their selected area. NASA officials said the space station is most visible in the sky at dawn and dusk. It will likely appear as a bright light moving quickly across the sky, as the space station flies at approximately 18,000 mph (28, 968 km/h). Editor's Note: This article has been corrected to clarify that the International Space Station appears as a bright light moving across the sky, not a streak; images that feature streaks are usually long exposures that show the station moving over time.